Our goal at Hawthorn Physical Therapy is to return each patient safely and expediently to their optimum level of function. Emphasis is placed on the development of individualized treatment plans to address the personalized goals of each patient. Our talented team of physical therapists and assistants work together with patients to help them achieve their rehabilitation goals through education, active involvement and the use of the latest therapy techniques and modalities. Physical therapy assistants with extensive experience and advanced training in specialty areas work closely with the therapists to carry out optimal treatment plans. Our location within Hawthorn Medical means we are able to have ongoing communication with the referring physician to ensure that the needs of our patients are met. Hawthorn also has the latest technology in computerized medical records giving our therapists the advantage of reading the latest physician visit notes and the reports of any diagnostic tests that the patient may have received. Referrals are accepted from Hawthorn physicians as well as physicians from outside of Hawthorn Medical. Therapy services are provided to children, adolescents and adults. Mark Leboeuf, PT earned a Bachelor of Science degree in Exercise Physiology and a Master of Science degree in Physical Therapy from the University of Massachusetts-Lowell in 1995. He has experience in acute, sub-acute and outpatient rehabilitation especially total knee and replacements, ACL reconstruction, and orthopedic conditions of the shoulder. He has specialized in vestibular rehab, specifically the evaluation and treatment of positional vertigo. A physician referral is required to begin assessment and treatment. Patients will be assessed and individualized plans based on the individual diagnosis and physician orders. Because of different body types, patterns of movement, and alignments, therapy will be different for each patient and the number of treatments needed will vary. If you need to cancel or reschedule appointment, call 508-996-3991. We ask that you give 24 hours notice. Please bring your physician referral with you. Be prepared to start your therapy at your first visit. Wear loose-fitting, comfortable clothing and sneakers or other comfortable shoes. It is important for you to understand your insurance coverage for treatment. Because insurance plans vary in their coverage of physical therapy, it is your responsibility to contact your insurance carrier to determine eligibility, benefit information and authorization for services. 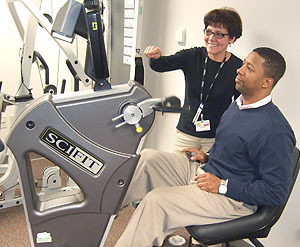 Our physical therapists and assistants work with patients to achieve rehabilitation goals through education, active involvement and the use of the latest therapy techniques and modalities.